Stone & Wood might be known for one beer above all else but the brewery has always brewed plenty of limited release beers too, arguably never more than now. Rarely, though, do those make their way much beyond the Byron Bay tasting room. 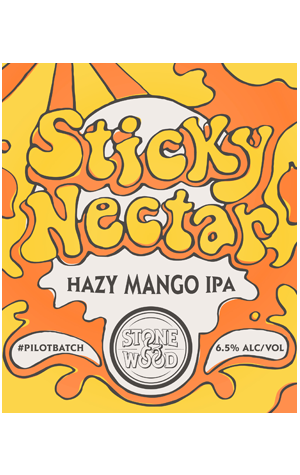 Thus, Sticky Nectar Mango IPA represents something of a shift for the brewery, not just because it’s been widely released on Australia’s East Coast but also because it's an IPA, a style the brewery has shied away from in the past, leaving it in the capable hands of sibling operation Fixation. Sticky Nectar was brewed to celebrate the start of mango season and features what the brewers describe as “truckloads” of fresh mangos. With the addition of lactose along with Galaxy, Citra and Amarillo hops, it’s a beer that sits in milkshake IPA territory, one that pours a golden haze, though it isn’t as opaque as many New England IPAs and has a smooth mouthfeel akin to a milk stout. The mango flavour is big enough that mango smoothie comes to mind immediately but there’s also flavours of passionfruit, papaya and melon in there and a noticeable, though restrained, bitterness.